We were planting seeds the other day. Indoors. This is Minnesota, after all. Over the course of many years of gardening I have worked out a system. 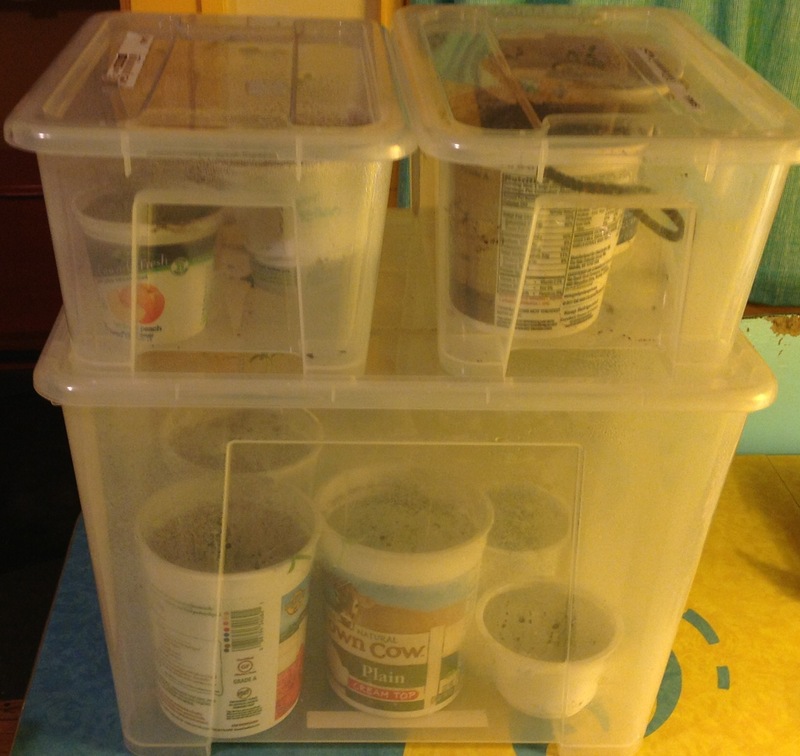 Yogurt containers, potting soil and these lovely clear IKEA containers. The IKEA boxes are a recent innovation. They keep soil moisture high (yet have enough volume to allow the plants to breathe), and they let me move plants inside and out according to the ever-varying spring weather (it was 80° on Sunday this week, and it snowed on Wednesday). Sorry for the digression. Back on task. We were planting tomato seeds by poking holes into the soil, placing one seed in each hole and covering the seed. We had discussed how deep to make the holes; that the depth corresponding to Tabitha’s first knuckle is not at all the same as the depth corresponding to my own, et cetera. Tabitha (six years old): How many holes should I put in this one? Me: Five. Put one in each hole. I hold out my hand with several seeds for her to take. T: But there’s more seeds than holes. T: So then they’ll be crowded. This is her line of reasoning, not mine. I had not been at all concerned with trying to offer the precise number of seeds she would need. I had simply shaken some from the pack into the palm of my hand. But since she started it, I develop a plan. I am going to do my best to get her to state the pigeonhole principle. Me: But what did you say about the seeds and holes? T: There are more seeds. Me: And what are the consequences of that? T: You said the plants wouldn’t grow as well if there are two in the same hole. So close! She is using the pigeonhole principle, but I cannot quite get her to state it. I tell her about pigeons and pigeonholes. We proceed to a lovely (and thoroughly uninformed) discussion of the mechanics of sending messages by carrier pigeon. She wonders, for instance, about how to send a message to your friend, since the carrier pigeon’s unique skill is to fly home from anywhere, but not vice versa. We deduce together that you must need to borrow your friend’s pigeon. Oh, and those tomato seeds? Brandywine. About a year ago, Tabitha was doing a dot-to-dot drawing. This is not the one she was doing. It is an example. Not a very good one, either. Things were going well. She got to 11. Tabitha (five years old at the time): I don’t know what twelve looks like. Me: It’s a 1, then a 2. With this tip, she cruised through the teens and got to 20. T: What does twenty-one look like? Me: A 2 and then a 1. Me: A 2 and then a 2. T: So twenty-three is probably a 2 and then a 3. This got her going on to 29. T: I don’t know what 30 looks like. Sometimes in mathematics, we need to live with new notation before picking its meaning apart too carefully. See also fractions, functions and derivatives. Numeration and number language do not develop hand-in-hand. Tabitha knows the number language; she can count past thirty. She has not learned how to read or write numbers that high. Patterns are powerful tools in mathematics. Tabitha’s experience in the teens gave her powerful intuitions for the twenties. After the Peeps photo session last week, I test drove my images with Tabitha (six years old). Me: Which are there more of in this picture? 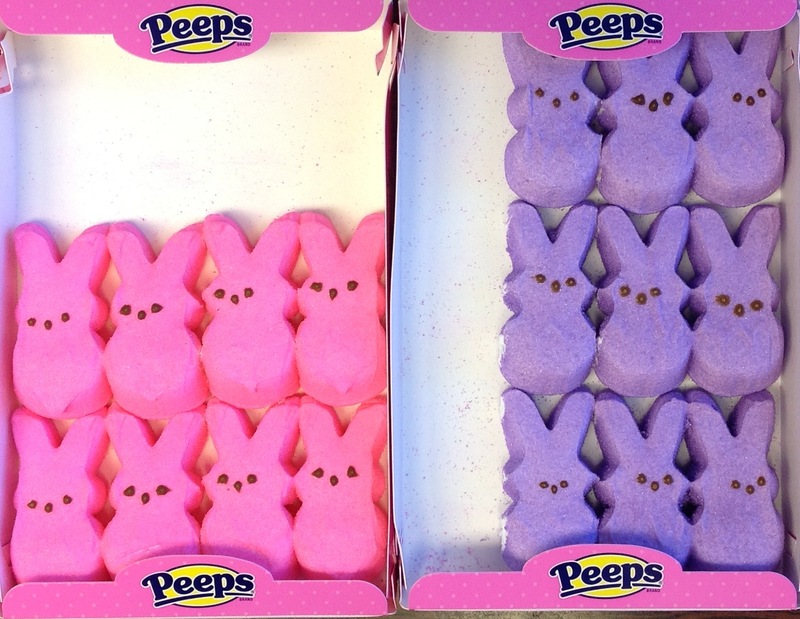 Purple Peeps or pink? T: It goes all the way to the top. Piaget would be proud. Tabitha’s focus is on one dimension, rather than on overall quantity. So let’s test that hypothesis. Does she really believe that’s all that matters? Me: What about in this picture? Me: But they both go to the top in this one. T: This one (purple) has full rows, and this one (pink) has holes. Me: Interesting. You know what I see? 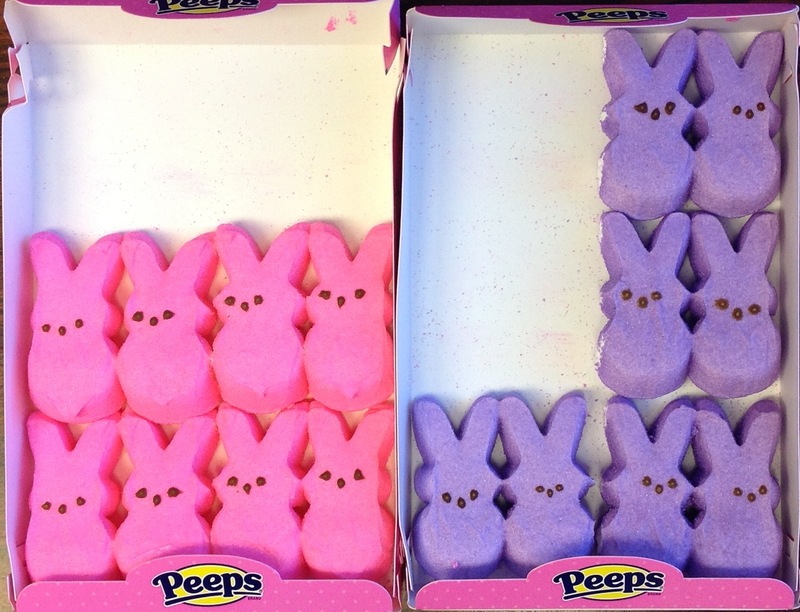 I see that if you moved that last bunny on the bottom row up to the next row, you’d have two rows of three and an extra bunny, while the purple has three rows of three. Me: OK. One last one. What about this picture? Me: Because it goes to the top? She proceeds to count 9 pink bunnies. I correct her and have her count over. She again counts 9 pink bunnies. 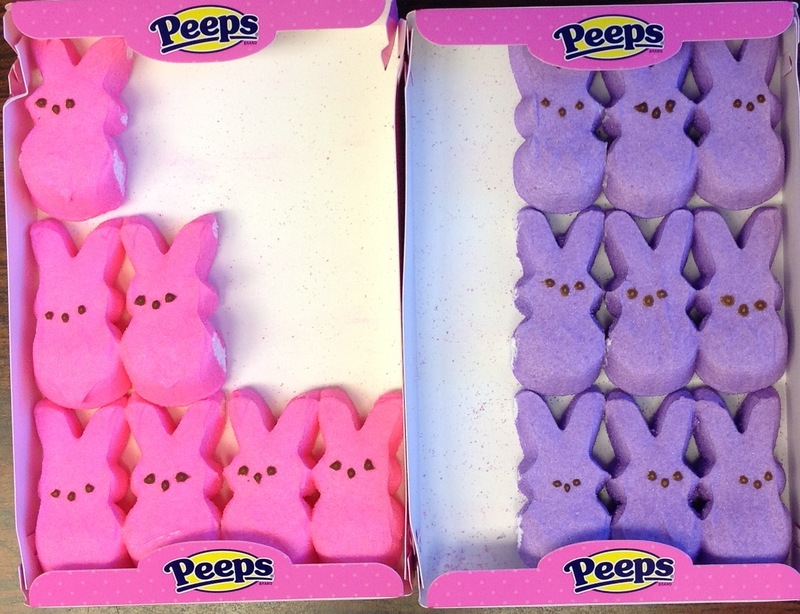 I show her that if you move the two top purple bunnies into the second row, you would fill that row. She is uninterested and we move on to other things. 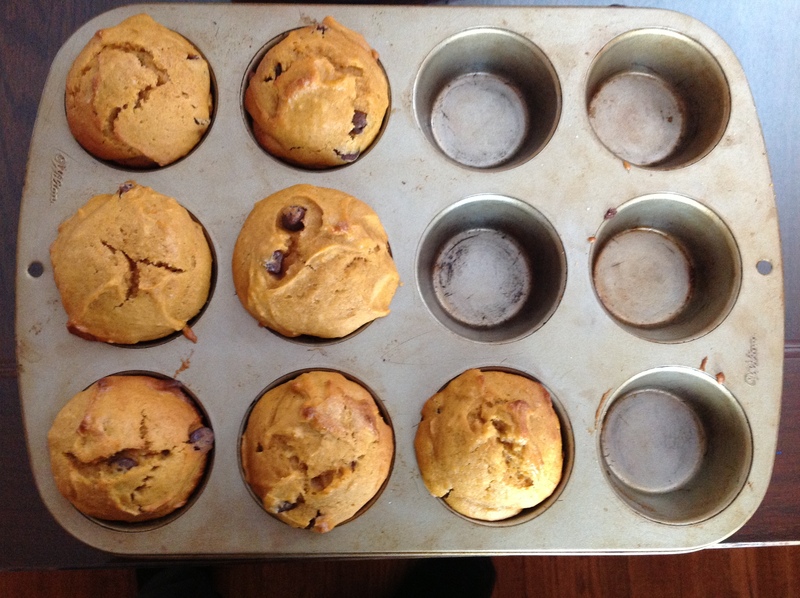 My wife Rachel made pumpkin muffins last night. Her contribution to the world of baking is the chocolate chip pumpkin muffin. I feel The Honest Toddler would approve. I know that Tabitha does. Tabitha told me about a dream she had last night. In the dream, there was only one pumpkin muffin left. Later in the morning, Tabitha counted the muffins in the tin. Me: Wait. Count those again? Et cetera, ending at eight. Tabitha: So really, we had eight muffins left. Me: I see, last night when you dreamt there was one, there were really eight. Me: That must be reassuring to you. T: Did you eat one this morning? Then it would be nine. I was taken to task this week for my assessment skills as they pertain to the then year old Tabitha and our shared game of Uncle Wiggily. The alternative hypothesis, of course, is that she noticed but put it down to weird parent behavior. I think I agree with Bill, just because she seemed oblivious to your omission doesn’t mean that she didn’t notice it, like Bill said, she may have just wondered why you were acting so strange. Great pushback from a great group of dads. Of course, I can refute none of these possibilities. I will say that it would be very uncharacteristic of Tabitha to let an error made by someone else (especially me) slide. So now, a bit more than two years later, I revisit Uncle Wiggily with Tabitha. And again I count to 10 by skipping 8. About 30 seconds worth here. Discuss in comments. On a related note, Robert Hawke has caught the bug and sends the following video report of talking math with his kids. If you like this sort of thing (and you’re still reading, so you do), it is worth the 2 minutes. Lots of great stuff in this one. A few years back, one of my elementary licensure students was trying to understand a conversation she been part of. In this conversation, an early elementary-aged child could not give a substantive answer to the question, What does five mean? I suggested to my student that this was a pretty abstract question and I wondered what exactly would constitute a good answer to it. And then I decided to show her what I meant by this. I made a video (embedded below) in which Griffin (who was five at the time) and I had the following conversation. Me: Can you count out five blocks? Griffin (five years old): [He does so flawlessly while mugging for the camera] What’s next? Me: Is five a number? Me: What does five mean? G: I don’t know. Do you? There you have it. He knows what five is, but cannot articulate what five means. There is more fun to be had here, though. Me: Is one a number? Me: Is zero a number? G: Because it’s…not necessarily a number. It’s not big…I don’t know. It’s just not a number. G: It’s not like any other number. This is very common. Another math (and physics) teaching dad, Casey Rutherford, discovered this recently when discussing what 10 takeaway 10 is with his five-year old daughter. She said zero. I asked him to pursue the question of whether zero is a number with her. @Trianglemancsd I stand corrected. Apparently zero is not a number. Having settled the status of zero, I ask Griffin about one half. Me: Do you know what one-half means? Me: Do you know what it means to have half of a cookie? Me: Is one-half a number? G: A number is like 2, 4, 6, 8, 9, 1…stuff like that. One hundred. A billion. Three hundred and ninety nine. Those are numbers. Me: And not one half. Examples. Griffin tells me what a number is by offering me examples of numbers. Maybe this is because he has no other way of talking about the meaning of words? Maybe he always offers examples as the sole means of explaining what a category of objects is. I investigate this hypothesis too. Me: So I’m gonna ask you one more silly question. Me: You’re playing with blocks there, right? Me: What is a block? 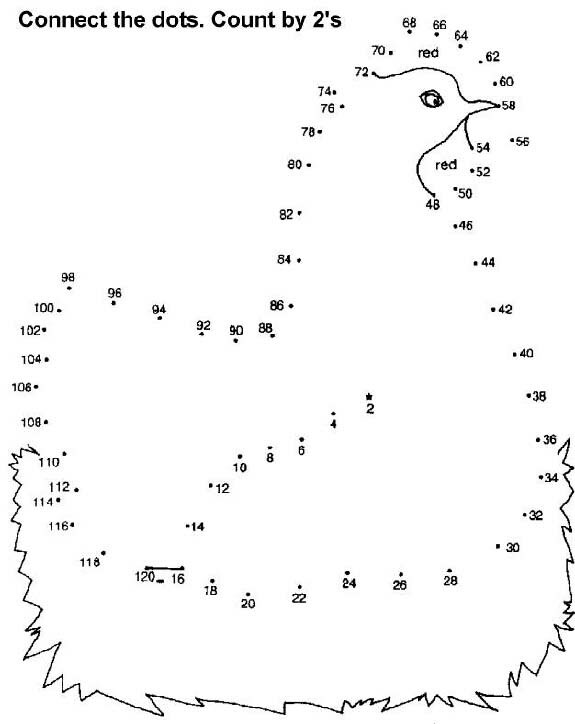 There it is—the abstract nature of numbers. What is a number? All he can give is examples. What is a block? He is full of characteristics of blocks, uses for blocks, categories into which blocks fit, etc. He has a robust and explicit scheme for sorting blocks from non-blocks. He has no such thing for numbers.